Wedding and party photographers (and regular photographers too!) 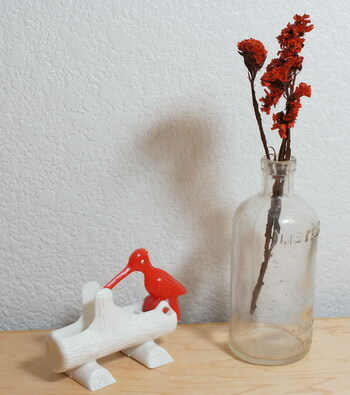 may want to check out the items below, both do a good job of diffusing the light from a direct flash blast, and make the subject in your pictures look a little better. I purchased the Gary Fong lightshpere a couple of years ago, and it actually works well, although it looks funny and somewhat unprofessional. Expect people to ask why you have a Tupperware® container on your flash! 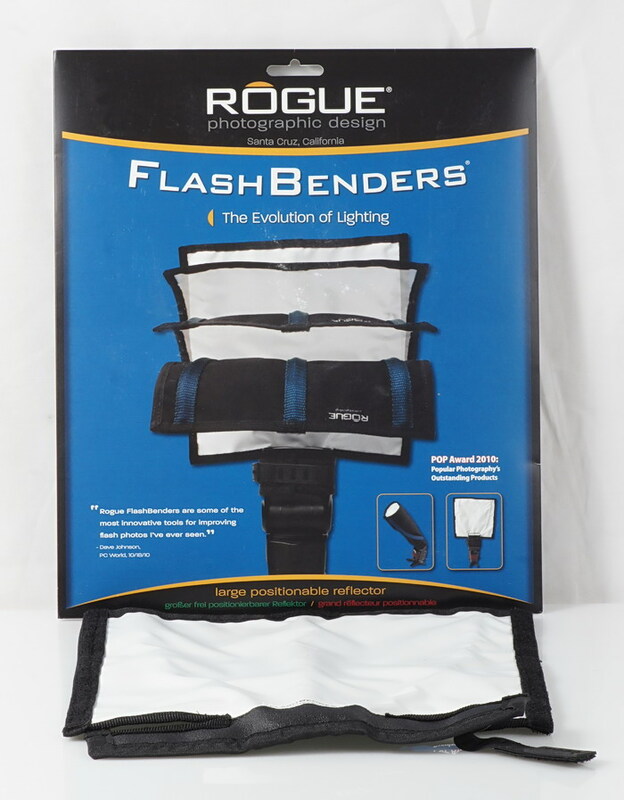 First up is the Rogue Flashbender large reflector, its reflective white material measures about 8.50" x 8.75" or 216 x 222mm, but the listed official size is 10" x 11" or 254 x 280mm. It has three bendable strips sewn inside, which allows it to be formed into various shapes and positions, including using it as a snoot, see image farther down the page or look at the first image, in the lower right corner. 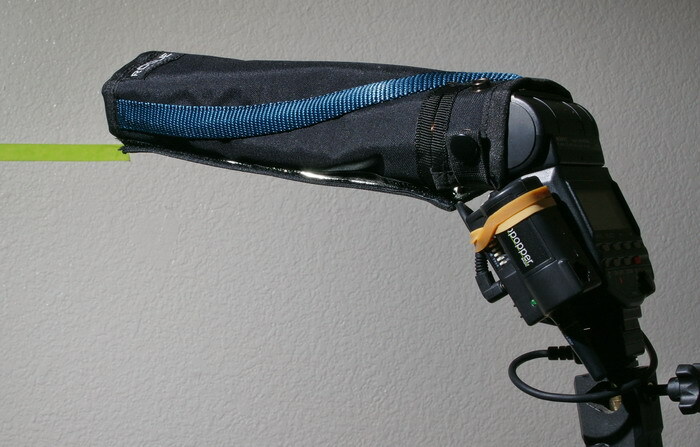 It attaches to any size flash head with a snap and velcro band, and seems very secure even when hanging down. A slightly smaller version is available too. I purchased this Gary Fong lightsphere a couple of years ago, although I don't think this particular model is still available, (but this one is probably the same with a different mount). My copy has a fixed opening for the flash head, and fits the Sony HVL-F56AM and F42AM, (and other brands that are similar in size), but the models I see for sale now have a universal opening, meaning they fit all flash heads by way of spreadable tabs and a velcro band. The size of the Lightsphere is about 4.4" (115mm) wide at the lid, and 3.25" (85mm) tall, excluding the mount area. The dome lid comes off if you want to bounce light out the top. In this shadow comparison I used an off-camera flash in the upper right position from the camera to make the shadows stand out a little more. The top left shot shows a bare flash only, and produces a pretty dark shadow and hard transition. The top right shot shows the effect of the Rogue flashbender with the reflector in the curved up position, (second product shot from top), and bouncing the flash off the reflector does seem to soften the shadows quite well. The bottom left shot is from the Gary Fong Lightshpere, in the position seen in the product shot, which is the dome is pointed straight at the subject. In this position there isn't too much light diffusion for some reason, even though the dome is frosted. The lower right shots shows what happens when the Lightsphere is used in the up position, or dome pointed at the ceiling. The diffusion is very smooth because the light is bouncing off the walls and ceiling, as well as directly though the frosted and textured side of the sphere. 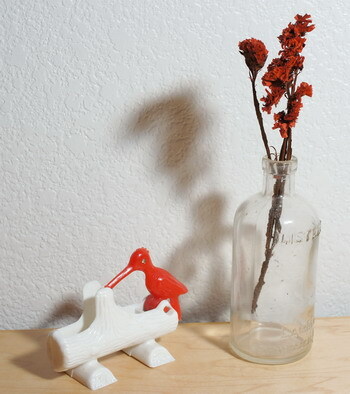 The walls are white in this room, which makes better use of the flash power, and keeps the color of the subjects correct. 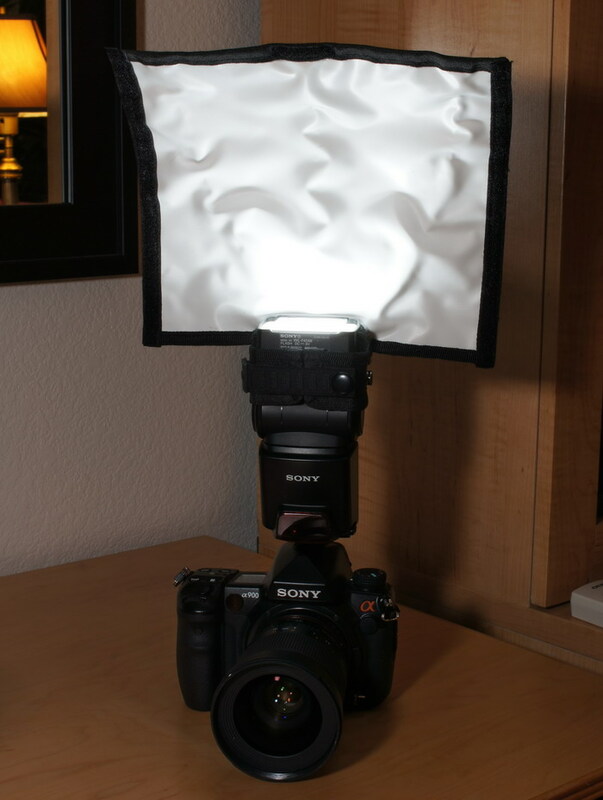 If the walls were painted a darker color, the Lightshpere may cause an undesirable color cast on the subjects because it's bouncing light in all directions, so the flashbender reflector may be a better choice in that scenario because it's bouncing flash off the white reflector. If you're in the middle of a large room with high ceilings, you won't have to worry much about color cast issues because at long distances flash intensity is greatly diminished. 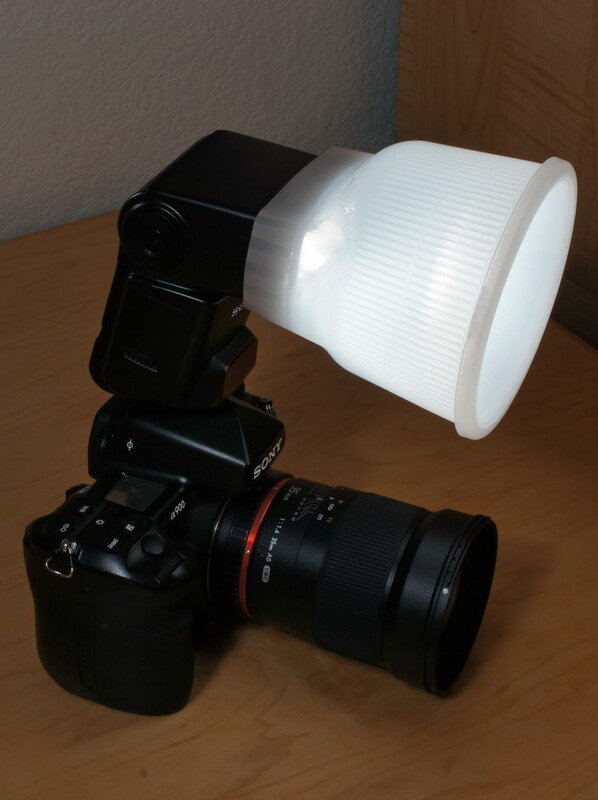 The Lightsphere can be used with the dome taken off, which causes more light to be directed through the top to reflect off a ceiling or wall, then back to the subject creating even more light diffusion, but at the expense of flash power. The camera settings are identical for each shot, however, the flash power was adjusted to match the exposures for each test, with the Gary Fong Lightshpere dome up position using the most power. Here we have the Rogue Flashbender rolled up to form a snoot. The flashbender has velcro to secure the ends together. The exit hole is not usually symmetrical as you'll see below. A snoot keeps light from spreading out and spoiling parts of the image that don't require extra light, and will reduce shadows in certain situations. This boring shot shows a flash spread using the internal zoom of 85mm at a distance of 3' or about 1 meter from the wall. 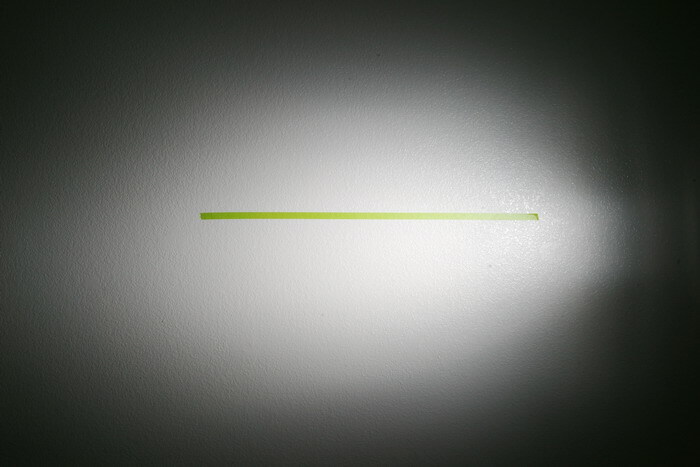 The green tape line on the wall is also about 1 meter in length. This is the area covered when using the flash and snoot, with the flash zoom still at 85mm, and using the same power. You always use the longest zoom possible for your flash unit, because wider zoom positions reduce the light output. The tight coverage is very useful for lighting areas such as chairs, cabinets or single items that you want to highlight, but do not want light-spill wrecking other areas in the picture. As a final note: I find the Lightsphere about the only thing Gary Fong puts out that's any good. 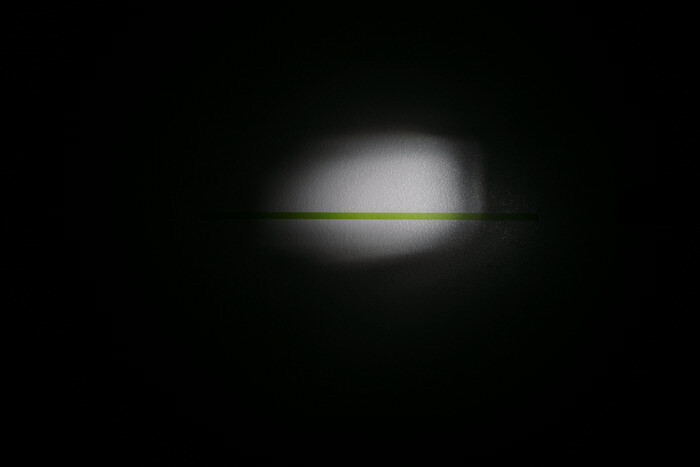 I bought his power snoot, and although it works, it showed the grid lines on even toned surfaces, so I sent it back. Most Gary Fong stuff is usually overpriced and not worth using in my opinion, the dome Lightshpere is the exception.